Great tributes indeed, not wholly unlike those paid to Indian spiritual gurus and Western cult leaders. More generally, the piece (by Mishal Hussein) is watery-eyed drivel, and its subject remains a truly unremarkable, very wealthy sockpuppet. Malala Yousafzai’s only qualification for the praises demanded from us lies in her being shot by the Taliban. Their reasoning for doing this – I concede – was certainly vile. She was one of numerous young girls in the Swat Valley to defend their right to attend school. To this (naturally), the Taliban are resolutely opposed and so – in a manner befitting their cowardice – they chose to silence Ms Yousafzai by bullet, shooting her on a crowded bus. The Hussein piece ruminates that the Taliban ‘must regret doing this now’. To be honest, they can’t regret it more than me. I am frankly sick of seeing her pinched little face grinning inside every newspaper I open. Her vacuous and unhelpful words (her latest suggestion is for us to negotiate with the Taliban) are also something we could do without. And why on earth is she living in Birmingham? The guru known simply as ‘Malala’ is supposed to be a fearless warrior for Pakistani women’s liberties. I can understand that she left Pakistan initially to receive surgery, but despite many local troubles, the women of the English West Midlands are still allowed to go to school. Is her work really required there. There are literally millions of brave women across the Islamic world who face down similar odds to Her Excellency, but who do not – like her – end-up in five-star New York hotel rooms. Some of them are even hunted in the West for becoming apostates from Islam. One thinks of the names’ Ayaan Hirsi Ali or Wafa Sultan. But we won’t have either of these speaking at the UN. There’s a reason for that. Ms Yousafzai has another value, alongside her chocolate-box ‘heroism’ story, for our political elites. She is the ‘Moderate Muslim’ par excellence. A visionary reformer of a culture unable to be reformed. She will doubtlessly also be held up as a ‘unifying’ figure, around which we can gather to bang tambourines and forget our differences, despite those ‘differences’ being the reason Yousefzai’s family scurried on a plane to Britain in the first place (there are many other hospitals she could have attended). According to the Guardian, Malala has recently sold the rights to her life story for 2 million pounds. This heart-warming entrepreneurialism will provide great comfort to those women the newly minted hero has left behind in Pakistan. Yousafzai is only 16. The BBC piece wonders excitedly where she can go from here. My suggestion and my hope is Heathrow Airport. Well, my suggestion to her would be: wait till she hits age 18; during that time, read voraciously and widely; surreptitiously read and lurk at websites like ‘Faithfreedom’ and ‘Former Muslims United’, surreptitiously devour books like ‘Infidel’ and ‘The Caged Virgin’, and then, the moment that that 18th birthday is past, rip off the damned burqa and publicly APOSTASISE. Preferably on the BBC in prime time television. Now *that* would be something. Indeed. She remains a devout Muslim from a fairly traditional background. This is why people should be cautious. She has recently suggested that we negotiate with the Taliban. .
A neocon? You guys are still around? I’m not a ‘Neocon’. I’m quite liberal. Questionable! How do we know the truth? “in support of Malala, to stand up for what Malala stood; education. It was the right thing to do”. Of course it is the right thing to stand up against such terrorism act. other student girls are not killed? This is a lame reason put forward. She was the only girl shot on the Bus full of girls by the masked terrorists. Pakistan is full of Girls Schools but not killed. that is put in front of us without the full evidence. Let us not jump on the band wagon. Talibans or others the enemies of Islam..
it was done by the Muslims-Talibans. HE will punish whoever the culprits are. The lies cannot last for long. Sorry, are you saying it wasn’t the Taliban who were responsible? Islam allows muslims girls and encourages education, cleanliness and good deeds. However the islam taliban are putting forword is not islam. It is a religion made by idiots who are not clean, not learned and not dollowing any parts of islam. Islam is a religion which demands Haqooq-ul-ibad(rights of people) more than haqooq Allah(rights of Allah). so the taliban donot follow haqooq ul ibad but they follow haqooqullah. that does not make them muslims. Islam is a line. Nobody can walk on it. someone sways left some right. about a km from either side is hell. so islam gives you the liberty of walking on a 2km wide surface. however the taliban think it as a thin line and thats it. they belive that if they kill people it would stop others from waling on the space god has given. Nither taliban are the holders of the islamic flag neither malala. they both are extrimists on opposite side. I live in pakistan, and have read her book. She says on page 75 of her book “We [pakistan] have around two million christians and more than two million ahmedies…sadly those in minority are often attacked.” Now tell me if pakistanis are people who do not respect others right then why is the racisem rate lowest here? so stop thinking the taliban are muslims and malala is not a great muslim as well. she has offendended many muslims and pakistanis through her book. So if you think taliban are muslims_you need serious treatment. What bothers many about Malala is that she presents a different face of Islam than the Taliban and more importantly a different way to confront the Taliban than drones and bombs. She believes peaceful measures is the best way. That takes courage. This is different from the Wafa Sultans and Ayaan Alis who benefit from the Taliban to portray Islam as such so they can attack it. No doubt Malala is an embarrassment to the Neocons. Yousefzai has no developed ideology of her own. She is being used by liberal forces who wish to promote a reformation of Islam, which is highly unlikely to be successful in somewhere like Pakistan. This is suggested by the fact Ms Yousafzai is carrying on her ‘reform work’ from Birmingham. On Facebook this evening I found myself politely dismissing one of my friend’s posts about how impressive Malala’s pacifist sentiments sounded on the John (?) Stewart show. I told him that Gandhi’s pacifism only worked with the British in India because we were civilised and sort of agreed already that we had no business to still be ruling India. However, if you try that kind of passive resistance Hitler, Saddam Hussein or the Taliban, as Malala was espousing, you shouldn’t be too disappointed if the gun-wielding Talib in front of you doesn’t have a Road to Damascus moment and see the error of his ways. He probably won’t even let you get your first sentence out. Anyway, after pouring scorn on my friend’s post I felt a little mean-spirited. However, your post has cheered me up no end since it made my post look like it had been written by a diplomat. Unlike mine, your post also made me laugh once or twice. I’ll come back here regularly. Thank you for the kind words. I did feel a little bad myself for writing this, but then I considered that Malala is in fact not a ‘child’ (as some in the media claim) but a wealthy and aspirational teenager. I find the cult of personality arising around Yousafzai incredibly disturbing. Malala Yusofzai is surprisingly silent over the Islamist “Trojan Horse” plot in Birmingham. While she was roped in — for a hefty fee I presume — for a hashtag photo-op over the kidnapped Nigerian girls recently (of whom the world has lost interest), a casual reader may wonder why she is silent over what is happening just a few blocks around her own private school, which, I believe has not been “Islamicized.” The details are sordid. Muslims schoolgirls as young as six are taught to regard British women as “white prostitutes” and non-Muslim teachers are routinely subjected to various denigrations by the Islamists. Is Malala coming to their rescue? What does Malala think of the “white prostitutes” whose tax-payer money is funding her bogus education activism? Birmingham is also the jihad capital of UK, and one wonders why her family chose to settle down there as there are enough UK Muslims there with ties to the Taliban. Birmingham should be the riskiest city for a person with Malala’s history. There are so many holes in the Malala story that I am beginning to suspect that the injuries she received may have been exaggerated for a propaganda coup. In just about every photo I have seen, she seems draped with an ugly dupatha staring smugly into the camera from the hospital bed. Contrast this with the photos of Alexander Litvinenko in his hospital bed. There was no indication whatsoever that she received a horrific and life threatening bullet wound. Why did her father continue to place her life in danger in the Swat Valley when the Taliban were threatening her by name via their radio broadcasts? Any reasonable father would have got her transferred to Islamabad or somewhere safer for her education. But he would have lost his lucrative contract via the BBC if he had done that. Any reasonable father would have done that. But not Ziauddin Yuosfzai who has made his millions from various “education consultancies” despite having a substandard grasp of English himself. There is already a cult developed around Malala as many of you had noted, and criticizing her is considered in bad taste. But the torrent of media panegyrics describing her as “extremely mature” and “intelligent” and for being “the most famous schoolgirl” in the world borders on the ludicrous. For someone who is the most “famous schoolgirl in the world” we do not know anything about how she is faring in her school. That’s the irony. Does she struggle with chemistry? Or history? Or does she get someone else, a teacher perhaps, to ghost-write her essays and course-works? Will she be academically evaluated with a lower yardstick — separate from other students — to keep the multi-million dollar Malala Brand going? Is pork served in her school canteen, or has it gone all “halal” since she has been there? Her websites focuses only on herself, and are bereft of details. Everything is about Malala, Malala and Malala and the awards she received for her “outstanding work.” In other words, nothing! In fact, the situation for Muslim girls all across the world has only deteriorated when the Malala phenomenon began to knock our senses into bewilderment. I really wonder where the Malala funds are going. Can you spot Malala’s mother in these pictures linked below. There is one, just ONE as Ziauddin Yusofzaihad long prohibited his wife from being photographed due to Islamic sensitivities. But when millions of free-flowing funds are at stake, a little leeway is need, I guess. She speaks highly of Islam. The Taliban also speaks highly of Islam. There is a confluence of interests here. Malala is now advocating “peace talks” with these very barbarians. What about the tens of thousands of other Muslim girls who will have to suffer under the Taliban’s Sharia tyranny? 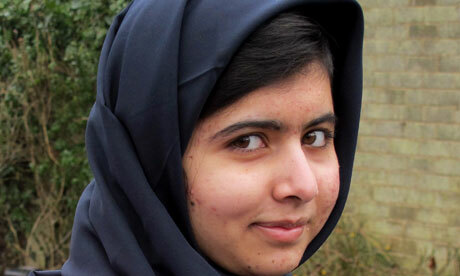 Does Malala Yusofzai care about their fate, or her Nobel Peace prize prospects. Does Malala have a road map to reconcile her ridiculous Taliban proposition? But that does not matter, as the Western media has been tasked to create a viral phenomenon based on empty rhetoric. What is her position on Sharia? What is Malala Yusofzai’s position on child marriages, the most notable being the marriage of Islam’s prophet Muhammad to the six-year-old Aisha? Since many celebrities have come out in support of her, what is Malala Yusofzai’s position on gay rights? For the Yusofzai family, the trauma Malala allegedly endured is now being cashed in its millions. In the meantime, tens of thousands of Western kids are living under an intolerable student debt burden, and tens of thousands of Muslim girls will continue to face the barbarity of the Taliban, Al Qaeda and a host of other psychopathic outfits who believe in Islam. Just like Malala. Malala Yusofzai, at the end of the day, typifies the well-entrenched Islamist sense of entitlement. They are allowed to work less, produce less, study less, and perform less and yet be chosen for lucrative roles for the sake of diversity. Even if her school resists pressures to contrive top entrance scores for her, Malala will still prance into Oxford, Cambridge or any other top British university, which, in turn will be pressured to deliver academic milestones strewn with fraud. Islamist entitlement does not come cheap, and it entangles its Western collaborators for life! I am sick of reading of Malala and her childish prattles that are shamelessly repeated as sui generis by the Western media. She has set a very low intellectual yardstick for more meritorious students of her age. Transcending Malala’s infantile standards may be deemed politically incorrect. Who knows? In the meantime, the Talibanization of Birmingham — Malala’s adopted city — continues unabated. I’m afraid you are simply not allowed to say any of that. Malala is a paradigm of virtue and modesty, the greatest modern advocate of female liberation, and a beacon of hope for the world to follow. She will accept very large donations with all due humility. Here! Here! The very fact that she can be held up as a model to follow when the only “substance” she his is an empty head filled with youthful pseudo-ideals, or more correctly maybe one or two. As you say she isn’t “leading” anyone, but is a “sock puppet” others are using. Your not going to be popular for that. But then, those who are right seldom are. Sounds like somebody is jealous. Can’t imagine Malala supporting your bum boy friends although it would not be politic of her to say so. My mum was born in Pakistan in 1910 to poor family she went to school. Don’t believe the hype. The Taliban who brought down the twin towers couldn’t shoot an 11 year old properly? How many bullets from USA and UK guns and drones have killed NON Taliban sympathizers ? More than 1 ? Malala has done nothing apart from writing her observations in her diary and by the way r u aware of female literacy rate in swat, yes it was on higher side even before and after Malala got attacked, there was no such thing that girls were deprived of education, few miscreants started bombing schools in swat but it was a temporary halt for girls to go to school..actually Malala’s father was a real cunning man, he had some links with foreign agents and he fully capitalized on that also geo brought her to limelight and phaphy kutni hamid mir who is master in creating hype made her heroine as once he tried to make hero out of that thief engineer waqar for water kit (what an illiterate anchor person)…now Malala drama is enjoying royalties of the book written by Christina lamb… Malala is just an ordinary average girl fully cashed by her clever and opportunist father… what a joke when her name was included for Nobel prize winners…. this world is full of dramas..
She did not earn or deserve any awards. It was all a propaganda campaign which has died down now and served its purpose.Review the events from the beginning: Picked up from a bus full of school girls (no education for girls?) A superficial injury which could not be cured in Pakistan? Flown out for treatment abroad and treated in Birmingham and not in London where the best medical care is available? Within two days the life threatening injury disappears and gives a press statement from the hospital bed? Writes a book which she is not capable of doing with her limited education? A campaign starts for Nobel Prize? Just use common sense to evaluate this and you will have million further questions which need answering. p.s. – Not only does she advocate negotiating with the Taliban, but she apparently gave $50,000 of her Nobel “peace prize” to Hamas. Wow. She just keeps getting worse.